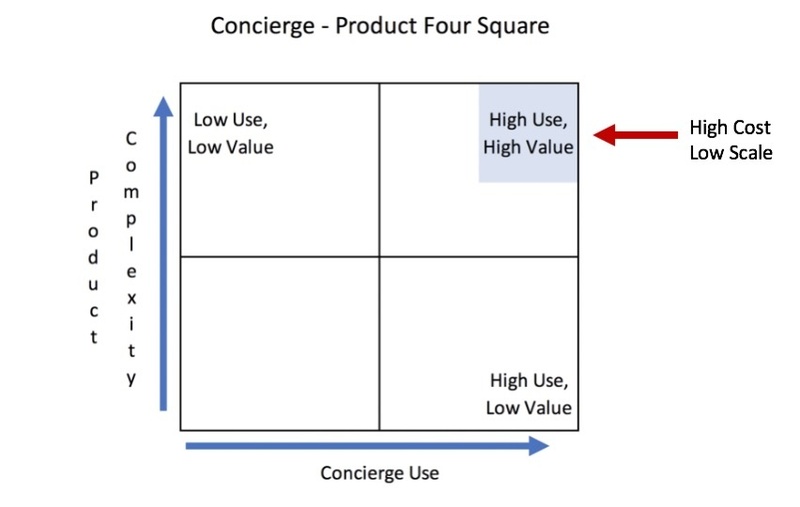 Using a four-square analysis below let’s compare the use of concierge service and product complexity, I contend that as complexity goes up, the use and value of a concierge approach goes up. In telecommunications, cloud and IT services our challenge is to differentiate our products and services from each other. That often means layering in complex, higher margin products on top of the traditional low complex network services. While the concierge approach does not pay off as well for transactional products, it serves a greater purpose in complex, consultative product sales. Where concierge is effective and deployed with great success, it requires more seasoned sales professionals to support the more complex sale. This costs more money and it also lacks the scalability needed to give your company sustainable growth rates the market demands. Sales leaders often find themselves asking how they can leverage the benefits of the concierge approach without the cost and scale issues that come with it. The first solution: Quote jockey does not translate into concierge success. Instead providing the right tools to quoting all of your products is necessary. See the blog post “Keeping Sales & Operations in Harmony” for more detail around the benefits of a comprehensive quoting form. If you can programmatically gather the requirements correctly, you can deploy logic, business rules and analytics to scale out most if not all of the product and sales configuration challenges. In a complex sale, this can save hours if not days of labor for each complex sale while shortening the cycle down to minutes. To scale, your sales people need to stop gathering requirements and quoting and turn that time spent back into caring for the sale. The second solution: Break the quoting portal paradox by giving visibility to the Channel Manager. 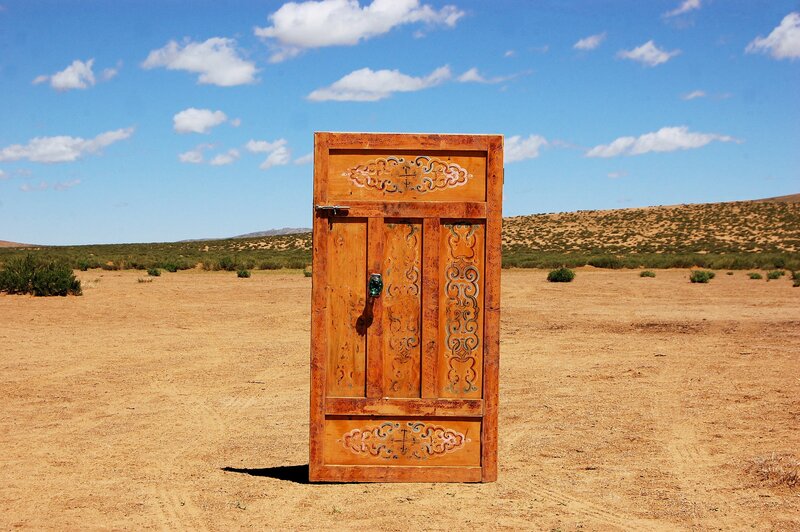 Quoting portals without visibility are constantly undermined by an eager Channel Manager wanting to stay connected to the partner. The concierge Channel Manager gladly does the quoting in exchange for visibility and connectedness to their partner. This solution is required in combination with solution #1 in order to unlock the potential of concierge by giving the Channel Manager visibility and time back in their day to focus on sales. The third solution: Now that the Channel Manager has visibility and time, they need to know when and where to white glove. Concierge efficiency is all about deploying an exceptions-based approach. There are many use cases I could mention but let me stick with the quote jockey trap mentioned in the first solution. Most telecom sales professionals find themselves in their email all day long and you wonder how they get any work done. There is a great blog called “Turning Off Email, Turning Up Productivity” by Anne Field of Workforce that resonated with me a few years back. She describes turning email off except for specific times in the day. She found that productivity increased significantly. If your concierge approach is dependent upon email, you have to read all the junk to get to the good stuff. That approach does not work, but rather your systems should tell you when there is work to do. If you are notified when the transactional sales threshold has been eclipsed and it is time to get involved, guess what …. You only spend time on things you need to get involve in, therefore maximizing your concierge effectiveness. Peak efficiency is obtained by systems telling Channel Managers where to focus and your systems need to support that approach. These solutions build upon one another. You can’t get a Channel Manager out of email and quoting if you don’t give them visibility into the quoting portal activity. You can’t expect them to be efficient if they don’t have a way to be notified when there is an important sale that needs white glove. These solutions go hand and hand in a way that returns time back to the sales process for the opportunities that need a concierge approach. My personal experience with this approach was fine-tuned over many years of managing the sales process. Shadowing a sales person or spending a day with the sales team exposed these “aha” moments. How can a sales person sell if they spend so much time doing these non-selling activities? So many hours a day they find themselves doing everything but selling. If that time can be given back to them, it makes perfect sense to believe their quota attainment will go up. Applying that to concierge becomes even more important. Time is precious, and competition is fierce. Don’t settle for manual concierge when an automated scalable version is out there to be had. Of course, we are happy to assist any way we can.